Climate: Seoul belongs to the Temperate Zone featuring four distinctive seasons of spring, summer, autumn and winter. The yearly average temperature of Seoul is 12.9 degrees Celsius. Temperatures in Seoul tend to fluctuate throughout the year, reaching as high as 36.1 degrees Celsius in the summer and dropping as low as minus 13.7 degrees Celsius in the winter. Influenced by the North Pacific high-pressure system, Seoul has hot and humid summers with average temperatures above 20 degrees Celsius from June through September. In the middle of summer, the city often records daily highs of over 30 degrees Celsius. In winter, Seoul is topographically influenced by the expansion of the Siberian high pressure and prevailing west wind with temperatures dropping lower than other regions on the same latitude. The rise and fall of the high pressure system causes a typical cycle of three successive cold days followed by four warmer days, relieving people from freezing temperatures. The annual precipitation in Seoul averages 1,210.2 mm, which is more than the average amount of rainfall across the peninsula. Most of the rainfall is concentrated in the rainy months (monsoon period) of June through September when downpours account for about 70 % of the total annual precipitation. Except for those rainy spells, however, Seoul boasts fine weather throughout the year and is especially famous for its azure autumn skies. Area: The total area of Seoul is 605.52km2, or 0.6% of the entire country. The Hangang (River) bisects the city into two parts: northern part (Gangbok) and southern one (Gangnam). Gangbok region totals 297.97km2 (49.2 %) while Gangnam is 307.55 km2 (50.8 %). Among the 25 autonomous "gu" or wards of Seoul, the largest is Seocho-gu (47.13km2) and the smallest is Jung-gu with an area only one fifth (9.97km2) that of Seocho-gu. The expansion of the city has been curbed since the last administrative reorganization in 1973. The lifestyles of Seoul citizens, however, have been influenced since the 1970's due to the rapid growth of satellite cities around the capital area. Bordering Cities & Counties: Gyeonggi-do: Goyang-si, Yangju-gun (county) and Euijeongbu-si to the north; Namyangju -si, Guri-si and Hanam-si to the east; Seongnam-si, Gwacheon-si and Anyang-si to the south; Gwangmyeong-si, Bucheon-si and Gimpo-si to the west. 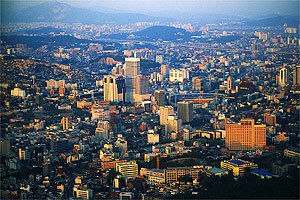 Population: Seoul has a population of 10,321,449 individuals and 3,458,511 households as of the end of 1999. This accounts for about a quarter of the total national population. As for the proportion of male to female excluding foreigners, men (5,141,141) slightly outnumber women (5,123,119). Five out of 25 "gus" have more than 500,000 residents. Songpa-gu has the biggest population of 668,421. In contrast, Jung-gu has a population of only 129,061. In the past 600 years since Seoul became the capital of the nation in 1394, the population of Seoul has grown 110 times. It has one of the highest population densities in the world of 17,157 persons/km2. The number of foreign residents in Seoul as of the end of 1999 is 57,189 or about 0.55 % of Seoul's total population. They include 18,763 Americans, 12,283 Chinese, and 6,332 Japanese. There are people of more than 90 different nationalities currently residing in Seoul, forming a small global village. Origin of Name: The name of Seoul comes from the ancient word 'Seorabeol' or 'Seobeol', meaning "capital"
GENEVA - Seoul is the world's fifth-most expensive city, while Tokyo remains the world's costliest, according to a cost of living survey released on Monday by a global consulting firm. The survey, conducted by the Geneva office of Mercer Human Resource Consulting (MHRC), said Tokyo is still the world's most expensive city, followed by Osaka, which jumped two notches from its previous ranking. London moved down from second to third place, followed by Moscow, which also dropped a notch this year. The city of Asuncion in Paraguay ranked the least expensive, the survey said. With New York as the base city for the survey's price index with 100 points, Tokyo rated 134.7, or more than three times costlier than Asuncion, which has an index of 40.3. South Korea's price index escalated to 115.5 from 104.1 the previous year, jumping two notches to become the world's fifth-most expensive city from a year earlier, thanks mostly to the Korean won's appreciation against the US dollar. Although London moved down a notch, it still remains the most expensive city in Europe, with a rating of 120.3. Survey analysts say steep accommodation and transport costs, together with the British pound's appreciation against the US dollar, have contributed to the city's high ranking. European cities well known for their high cost of living, such as Moscow, Geneva, Zurich, Copenhagen and Oslo, remained in the top 10 this year. Many cities in countries that have recently joined the European Union (EU) have risen sharply in the rankings this year as they make strides to bring their economic infrastructure up to EU standards, according to a survey analyst at MHRC. MHRC's cost of living survey is used to help multinational companies and governments determine compensation allowances for their expatriate employees. The comprehensive survey is conducted annually in March. The survey covers 144 cities across six continents and measures the comparative cost of over 200 items in each location, including housing, transport, food, clothing, household goods and entertainment, according to the consulting firm. Four of the world's 10 costliest cities were in Asia, with Hong Kong ranking ninth. Chinese cities have dropped significantly in the rankings, as China's currency, the yuan, is pegged to the US dollar and has been affected by its depreciation. Beijing ranked 19th, dropping eight notches this year, followed by Shanghai in 30th place. New York remained the most expensive city in North America, in 14th position with a score of 100. Other costly cities included Los Angeles, ranked 44th, followed by San Francisco in 50th place and Chicago in 52nd place. Though still relatively inexpensive, Canadian cities continued to move up in the rankings due to the strength of the Canadian dollar. Toronto was ranked 82nd. In Australia, Sydney remained the most expensive city, ranked 20th, with a score of 95.2. Auckland and Wellington moved up in the rankings this year to 69th and 76th respectively.